On June 26, 2010, Revgear sponsored fighter Mike Baskis (5-3 pro, 9-0 am), then fighting out of Elizabethtown Brazilian Jiu Jitsu and Judo in Elizabethtown, KY, fought in the inaugural show of CG Promotions: Queen City Meltdown. 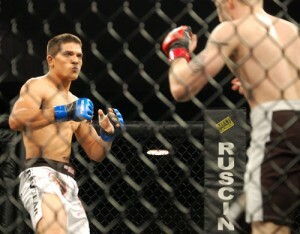 Mike was facing the undefeated Tom Hayden, an alum of the popular UFC reality show, The Ultimate Fighter. Fighting in front of a crowd that included Jorge Gurgel, Rich Franklin, Marcus Davis, Dustin Hazelett and Zoila Frausto, Baskis and Hayden had numerous good exchanges on the feet and on the ground in the first round, with Hayden likely winning the round on the judges’ scorecards. In the second round, Baskis took control, winning the battle on the feet and the ground until a controversial referee stoppage where Baskis was said to have kneed Hayden in the head while Hayden was down. Despite protests by Baskis and his corner that the knee was in fact a legal knee to the chest, the referee ruled it an intentional foul and Baskis was disqualified when Hayden could no longer continue.